To our right, we see the second circular events butterfly including 16 factors. This example is presented to demonstrate how much profit the first wave of building supply companies can look forward to. To assist the understanding of the process this presentation is interactive, as you can see, under the 16 headings on our butterfly there are check boxes. Over the following page is a spreadsheet that suggests an increase or decrease in profitability assigned to each box, alongside a brief explanation. Please read the explanation and its predicated increase or decrease and write your opinion in the each box. First: Answers will assist the process, and may lead to an increase or decrease in the forecast or result in a more detailed explanation presented. Second: Correct answers become a validation exercise. Third: The exercise is designed to engage the mind, and make the reader appreciate the mathematics, it’s one thing to read a profit forecast summary suggesting a 5174% return on investment, it’s another to have looked at and agreed with its every detail. As a general rule, with all questions, due to a large degree of leeway, most, if not all estimates have been set lower that most would forecast. For instance in the authors personal experience, the loss of all financial staff and accounting costs, alongside the correct financial data presented and advice from a dedicated operation centre would have lead to a 50% rise in profitability, however for cautions sake only a 5% rise in profitability is recorded. When answering questions, please do not follow the authors caution, please give a genuine estimate, not guarded or over exaggerated, writing in higher or lower percentage rises where applicable. In the last section we heard that $2 billion plus, is directly invested into each resort, where after the first $1 billion in profit from all networked companies is reinvested, in theory creating capital assets worth twice the investment price. The time it takes for the initial $1 billion in profit to be made and reinvested is estimated at just over two years. After which by the end of the fourth year another $1 billion in profit is projected to be generated, this $ 1 billion is matched or increased by a new set of mainly small businesses, thus enough capital is available to start another resort and operation center, within a 6000 square mile radius of the initial resort. After which, via the “Baby POP” cash injection process, this procedure repeats over 22 years until 16 resorts and operation centers are created within the 6000 square miles, approximately one every 28 miles. All told, including home building, shops, offices, malls, marina’s, attractions, hospitals, university campuses, municipal buildings, a sports village and infrastructure over the first four years 2014 to 2018 upwards of $2.5 billion is spent. For this excursive we will assume half goes to the contractors and laborers and the balance on supplies, bricks, mortar, roofing, bathrooms, tiles, windows and the like. For this example I have created a fictitious window manufacturing company entitled “The Window Factory” specializing in residential aluminum windows. To supply all the homes in a resort “The Window Factory” receives an annual order worth $2.5 million. Like many or even most US small businesses in the construction industry, we shall suggest the currently this company is simply treading water, making enough to cover costs only. To start proceedings “The Window Factory” will take out a $2.5 million loan, supplied by a network bank, paying interest only, as such “The Window Factory” starts its network life making a 6% annual loss. Above we find the suppliers and manufacturing butterfly spreadsheet, the blue squares indicate a profitable event, the orange representing an event that increases costs, pink squares indicating money in, and grey indicating expenses. Column 2, row (n) “Total Sales” indicates The Window Factory is receiving $2.5Million a year. In row (r) “Total Costs,” including the interest on the investment loan, are at $2.65Million: As such row (w) “Total Profits” is equal to -$150,000, beneath this, row (x) indicates the company’s profit vs. revenue ratio is at minus 6%. SB1. Colum 3 – Financial Software: The first blue box in row (g) indicates a decrease in costs, as all financial tasks from bookkeeping to auditing, are handled by the staff at the operation center. The second blue boxes (k & l) are as one, the lower (l) indicating a 5% rise in financial efficiency. The software is directly linked to the bank removing most human interaction. Instead of one check and balance system, the software has four running concurrently, due to the financial systems, cash handling aside, human error and fraud become all but impossible. Due to the increase in financial efficiency, is the 5% rise in revenue recorded in row (l) justified? SB2. Colum 4 – Business Advise: Over the first 4 years a team of a hundred or so senior analysts, logistics experts, engineers, software developers, network officers and industry specific business persons will spend six months working on the task of making all the window companies on the network more efficient, from cost savings, to sales techniques, to sourcing cheaper suppliers. Over time, with hundreds of window companies on the network, each company’s triumphs and failures are recorded and analyzed, the information used to assist others. At The Window Factory’s home resort & operation center, dedicated analysts gather all the data from the think tank, tweak the software and share the knowledge and findings. As a result, a 16% reduction in miscellaneous expenses is forecast (from energy to staples), a 10% increase in sales is predicted and material costs are expected to be reduced from 50% of total sales to 40%. SB3. Colum 5 – Marketing Media & PR: Initially the dedicated Media & Marketing division working from the operations center make the S-World & S-Web applications, including photographing, filming & 3D rendering of the products, alongside the S-World presence, S-Web creates a state of the art website for The Window Factory, that alongside their own windows and accessories, offers many different types of windows from the other companies on the network, alongside many other building services, patio’s, bathrooms, kitchens, etc., which when sold generate extra revenue. One also needs to factor in, the general good will of the people in the catchment area knowing that a purchase from “The Window Factory” is securing their pensions, healthcare and indeed helping to save the planet. All factors combined increase sales by 15%, Higher ________ OK ________ Lower ________? SB4. Colum 6 – Resort Order 1: The main advantage for The Window Factory and all other manufacturing companies is guaranteed orders from the networks to which it is affiliated. SB4 is not a question field, as it is a definite action within the business plan. The first order from a resort network is placed; an increase in materials, sales tax, salaries and miscellaneous spending increases costs to $4Million, while sales increase to 5.8Million, after the staff profit share bonus, “The Window Factory” is now making over $1.5Million in profit. SB6. Colum 9 – Local Orders: Due to the 20% discount in price it is forecast that local orders increase by 25%. Is this a reasonable assessment? Higher ________ OK ________ Lower ________? SB8. Colum 11 – Advisory 2, marketing 2: With over 4 years spent at the operations centre on business analysis, network growth, improvements in software alongside continued marketing and internet work , material costs are expected to fall by 2.5% & and 25% increase in local sales is forecast? SB10. Colum 13 – Staff Efficiency: Please note row (u) “Staff Bonuses” and the row above (t) “Profit Share”, 12.5% of the profit made by the company is shared amongst the staff. By 2018 after 5 years staff salaries have effectively doubled, if the company had made more sales their salaries could have tripled. Staff are offered first phase property purchase options in future resorts and subsided eco friendly automobile purchases at 30% below manufacturing costs with a 4 year 50% buy back, making a $10,000 car cost $52 a month, the same cost as one would pay for a day’s hire. As such wastage of raw materials is expected to be reduced lowering material costs from 42.5% to 40% and local sales are forecast to increase by 25% as all, especially the sales staff are motivated to increase profitability. Note this increase in sales and efficiency is factored over five or six years. SB11. Colum 14 – New factory: By 2021 enough profits have been made to build a new efficient factory and dedicated alternate energy power source, lowering miscellaneous spending (including electricity) by $125,000 a year and lowering materials costs, as some materials that were purchased from suppliers can now be made at the factory. Material costs are predicted to lower from 40% of revenue to 30%. Increased quality is expected to increase local orders by 25%. SB13 a & b. Colum 16 & 17 – Discount 2: Product price can now be lowered by 30%, The Window Factories products are now 50% lower than its 2014 price, material costs rise back up to 40%, miscellaneous spending increases by $100,000. As products are now 30% cheaper alongside continued work from both the media and business advisory departments a increase in local orders of 50% is forecast. SB14. Colum 18 – Resort Order 6 (3+3): In 2026 three resorts are being built simultaneously generating orders of $2,5Million each, alongside three others are expanding and providing orders of $250,000 each. Over the 5 years due to the media department, business advisory service, staff motivation and increased good will within the local community as the medical and ecological initiatives become more visible local orders are expected to rise by 25%. SB15. Colum 19 – Resort Order 8 (4+4): In 2028 orders from the resort increase again, there are now 4 resorts in their initial hi budget phase and 4 in their continued lower budget phase. More staff bills and miscellaneous expenses are incurred. Along with two years progress by the various departments at the operation centre, a further increase in local good, the marketing budget is raised by 25%, all told over two years a 25% increase in sales is forecast. SB16. Colum 20 – Resort Order 16 (4+12): By 2036 the 16th and final resort begins, by this point staff bonuses are now double their basic salary, this alongside the extra 8 years of marketing, business analysis and by this point earth changing PR as the combined resorts across the USA attend to all Medicaid and Medicare liabilities, alongside producing green energy for over half of the USA. Due to the above, over the final 8 years a 50% increase in local orders is forecast. Note: The 2014 to 2036 figures do not include, building contracts offered to the operation centre’s building company for building developments, infrastructure and private housing outside the resort. The local sales row only forecasts sales to other building companies and individuals within the 3000 square mile local area. A fair to large amount of private and government contracts are expected further, increasing income. Summing up, for a $2,5 million arranged investment, working on a guarded (low) estimate the building company should expect to have accumulated $130 million by 2036 a 5175% return, the equivalent of putting the $2,5 million in the bank at a 19.65% interest rate. However this model does not include inflation as such 22.65% is more accurate. America Butterfly Question, AB3: Has the case been made that within manufacturing the window factory business model is innovate and profitable? Defiantly ________Probably ________Not Really ________? On the subject of inflation, in general terms it makes little difference to the model as under normal economic circumstances expenses and product prices would increase at the approximately the same rate. A typical example is in energy, the process of digging or drilling for fossil fuel then transporting it, then processing it is expensive, and as it is a limited commodity, supply and demand further raises its cost. Once manufactured, Solar Arrays and hydro power save on maintenance and have no such cost implications, added to that eclectic, cars’ prototype batteries can power a car 300 miles on a single charge costing only $10. A more specific example of this is in the cost of housing. At first, it is hoped for resort property values will increase making investments more attractive. By 2036, with supplies at half the price they are now, and in general after 22 years, with many improvements in building economics and logistics created at the research centers, one would expect the cost of construction to be greatly reduced. For example if in 2014 a property costs $300,000 to build (including land and infrastructure) if building supplies cost are reduced by 50%, in 2036 the same property will cost $225,000. At the same time, today the average post tax household income is $50,000; if by 2036 it rose to $75,000, the same house will cost three years household income, as opposed to six. This brings the American Butterfly solution back to the core of economics, as the word economics was invented by the Greeks, who called it Oikonomia, and it was defined as: the management and building of a household. Building houses since the beginning of democracy has been the foundation of economics. At first this may present a quandary. Since all citizens would effectively have twice what they have now, it might be difficult to comprehend. Many would think, if it was that simple, why is it not so now? There are many additional factors that will be illustrated throughout the thesis; the spreadsheet below looks at the, “Profit vs. Revenue” ratio, which is further highlighted on the bottom row (x) of the main “Window Factory” spreadsheet presented a few pages back. An analysis performed on the Fortune 500, (the top 500 revenue making companies in the USA), including their global operations, showed their combined revenue in 2011 was $10.8 trillion with average profits at $750 billion. As such their “Profit vs. Revenue” ratio is 7%. For every $1 they take in they make 7 cents profit. Below is the “American Butterfly” supplier’s model “The Window Factory” in 2018 showing a 31% “Profit vs. Revenue” ratio (c). As such for every $1 they take in, they make 31 cents in profit, making “The Window Factory” four times more financially efficient than the average Fortune 500 company. 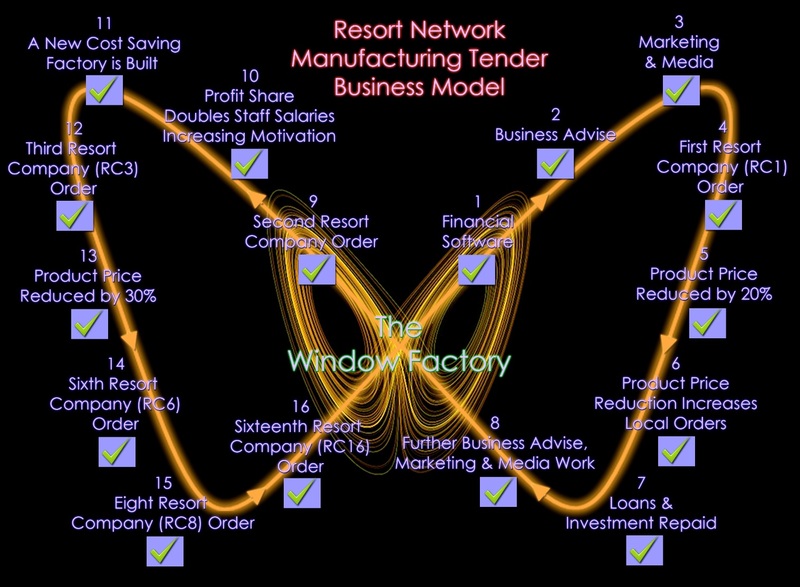 However, as all networked companies work as a unit the “EEE” (Ecological Experience Economy) economic model assisted by the “PQS” (Predictive Quantum Software) looks deeper, factoring the suppliers of “The Window Factory”. All told for every $1 “The Window Factory” receives the combined primary network companies make 58 cents. A financial efficiency increase of just under eight times the Fortune 500 companies if considered as a collective. This ratio rising as the years go on. Going further as “American Butterfly” is an US economic solution, in financial efficiency terms one includes government tax yields (t), thus for every $1 paid to “The Window Factory,” 76 cents is accounted for, leaving what is commonly known as an “Economic Black Hole” factor of 24%, which by the time the PQS has received 22 years of development the “Economic Black Hole “ is desired to drop to zero, as that is the specific function of the PQS. The above spreadsheet alongside the influences from physics that inspired the profit vs. revenue approach to American Butterfly are later presented in great detail within the American Butterfly part 3. Physics aside, there is a very practice explanation as to how small companies can outperform established global companies in such a fashion. First: As far as big companies are concerned, it matters little to them what their profit ratio is as at the end of the day. The only thing their shareholders care about is profits and dividends. If we take a look at Walmart, the USA’s largest revenue-making company, last year it took $420 billion in at its registers, and made $16.4 billion in profit, a “Profit vs. Revenue” ratio under 4%. The company makes profits, share prices go up and dividends increase. The share holders are happy, so the board is happy, so the CEO is happy. However, this business model is not a good economic model as for every dollar they make, another company does not. The “American Butterfly” model works differently. For example, initially the primary source of income is the construction of the resorts, from a $1.5 billion order (tender) to supplier companies; one seeks to generate as much profit as possible. In the case in question: “The Window Factory” vs. “Walmart”. The Resort Company Network profits would be $1 billion vs. Walmart Corporate profits at $58 million. Second: Loyally, drive, and the communal desire to make as much profit as is humanly possible. If one told all employees at Walmart that they would be paid regardless of whether they came to work or not, few would turn up the next day. By the same token, offer the executives double the money to work at a rival firm, few would stay put. The resort suppliers business model consists of many small business owners who are of course loyal to themselves and staff on profit share, thus regardless of basic salary, every day is seen as another day to make more profit, and so increase profit share. America Butterfly Question, AB4: Has the case been made that given competent operation center management and next generation business & networking software, an alliance of many small businesses can be more efficient than a single large business? Definitely ________ Probably ________ Unlikely ________?